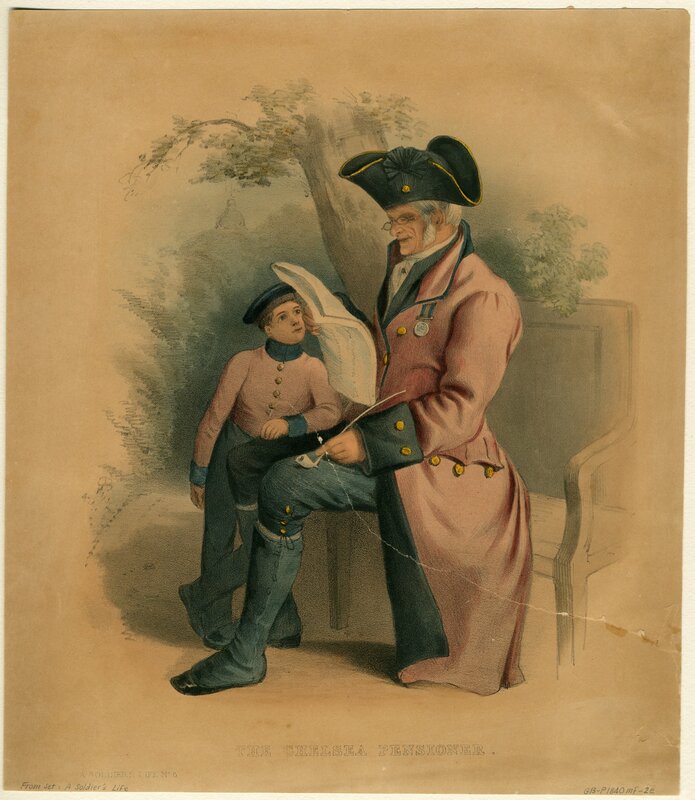 By October 1842, Captain John Biscoe was in such poor health and so impoverished from “the hardships and privations” endured on his voyages of circumnavigation and exploration of the Antarctic and desperate enough to return to England that a subscription was advertised for charitable donations to pay the costs of sending him and his family home. 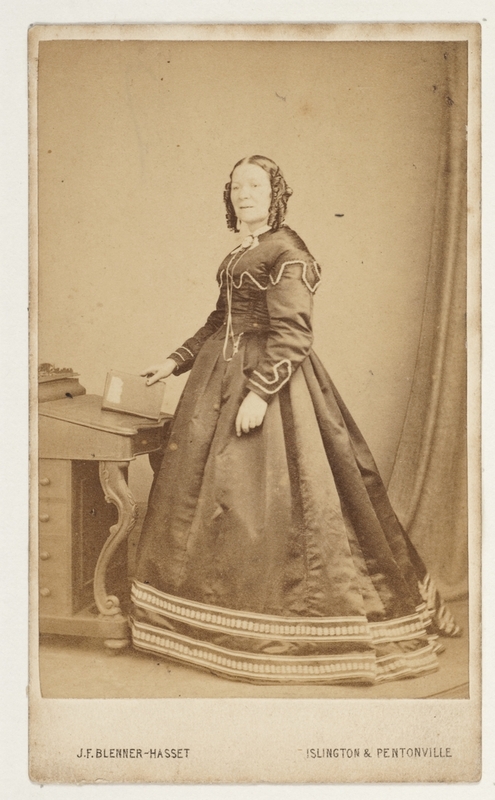 With urgency attending the voyage, Governor Sir John Franklin initiated the subscription and underwrote the cost for Captain Biscoe, his wife Emma Biscoe nee Crowe, and their four children to sail on board the barque Janet Izat, commanded by his good friend Captain Edward Goldsmith. THE CHARITABLE DONATIONS of the public are earnestly solicited on behalf of Captain John Biscoe, late of the Marian Watson, and formerly of the schooner Tula, of about 120 tons, in which vessel, accompanied by the cutter Lively, of forty-six tons only, he explored the Southern Regions, generally, for the space of three years; whose unexampled intrepidity on that occasion, in the search of scientific knowledge, is admitted by public testimonials from the British and foreign governments, and whose tract is marked on the present Admiralty charts; the hardships and privations of that voyage gave a blow to his constitution, which, after a long series of illness, has at last incapacitated him from following his profession. His friends now seek tho means to enable him to return with his family to England, and confidently appeal to the benevolence of the Van Diemen’s Land public to effect it. Subscriptions received at all the Banks, and by Mr. William Carter, Treasurer. Captain Goldsmith had departed London on the bark Janet Izat, 229 tons, on 24th June 1842, arriving at Hobart, Van Diemen’s Land (Tasmania) on 26th October 1842. A week later, on November 1st, he dined with Sir John and Lady Frankiln at Government House in the company of Messrs Calder, Boyes and Mulligan. Their plan for the safe return passage of Captain Biscoe and family with Captain Goldsmith was chief among topics of discussion at dinner, and on the topic of polar exploration, John Franklin no doubt foreshadowed his desire to reprise a commission from the Admiralty to lead a naval expedition to the Arctic. The Janet Izat stayed in Hobart with preparations for departure nearly complete by January 20th, 1843. Source: Colonial Times (Hobart, Tas. : 1828 – 1857) Tue 1 Nov 1842 Page 2 SHIP NEWS. EDWARD GOLDSMITH (late of the Wave), Commander, having all her oil and a great part of her wool on board, will positively sail as above. For freight or passage, apply to Captain Goldsmith on board, or to KENNARDS, CHAPMAN & Co. The above vessel has excellent accommodation for steerage passengers. New Wharf, January 20. The Janet Izat sailed without delay on February 15th 1843, with twelve cabin passengers – Captain Biscoe listed simply as Mr. Biscoe – and eleven in steerage. 15. – Sailed the bark Janet Izat, 220 tons, Goldsmith, for London, with oil and wool – passengers, Mr. and Mrs. Doughty, Mr. amd Mrs. Biscoe and family, Mr. Barnard, Mr. Tennyson, Mr. Arthur Sutherland, Miss Rowe; and eleven in the steerage. News of Captain Biscoe’s death at sea was not published until November 1843. He had died on the voyage between February 15th and the arrival of the Janet Izat back in London in June 1843. 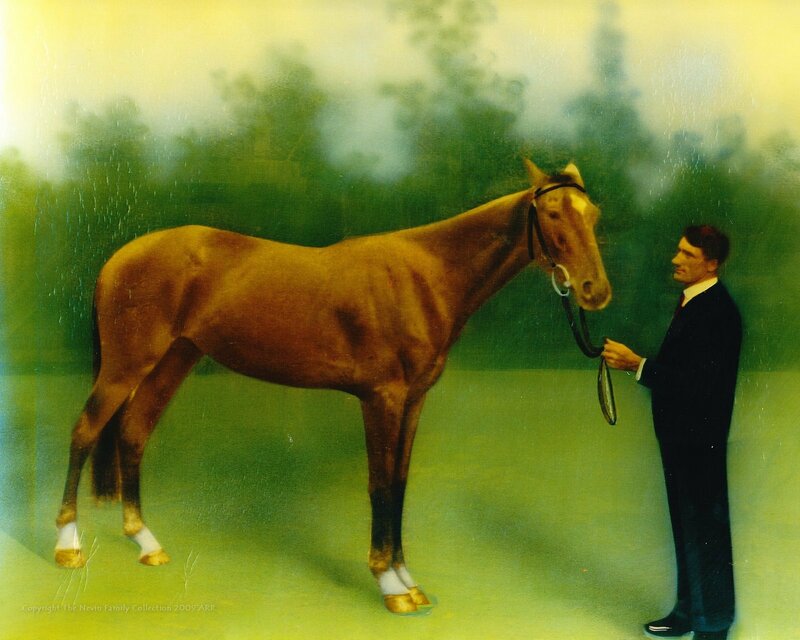 THE LATE MR. JOHN BISCOE, R.N. – Our readers who delight in deeds of charity, will find in our advertisement sheet, a tale of sad distress that will call forth all their commiseration. 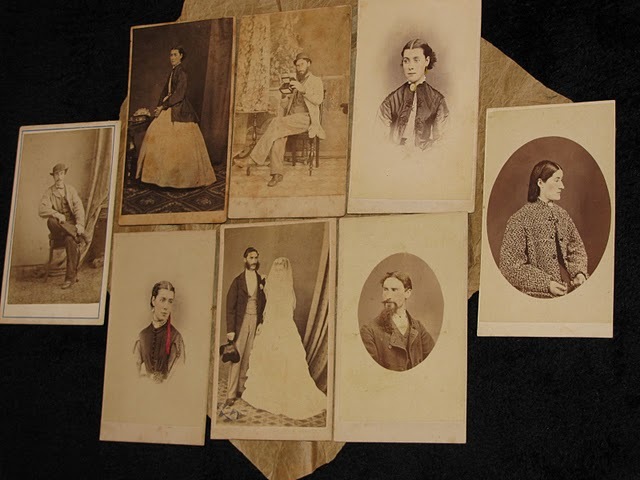 The case of the Widow and Four Children of the late Mr. Biscoe, Acting-Master R. N. , was happily discovered in time to prevent them from perishing by mere want of sustenance and common apparel. So distressing a case among the widows of Naval Officers we have never before met with, and such a one is scarcely credible in this land! We trust some of the influential individuals whose name we see among the subscribers, will not stay their efforts in the good work thus commenced, until the objects expressed in the advertisement are achieved. And were those objects and the condition of Mrs. Biscoe and her children, made know to Her Majesty the Dowager Queen Adelaide, the real friend of the sailor’s widow in distress, we are satisfied they would not be unheeded. John Biscoe (1794-1843), sea captain, was born at Enfield, Middlesex, England, the son of Thomas Biscoe of Waltham Abbey and his wife Anne, née Tibbs. In 1812 he joined the navy and served during the American war in the San Domingo, Colibri and Moselle, of which he became acting master. After the war he joined the mercantile marine, sailing as mate and master to the East and West Indies and to most parts of the known world. In 1830 he was appointed by the London whaling and sealing firm of Enderby to command the brig Tula, 150 tons, and the cutter Lively, 49 tons, on a voyage of discovery to high southern latitudes. The vessels circumnavigated the Antarctic continent, visited the South Sandwich and South Shetland Islands, and discovered Enderby Land (28 February 1831), Adelaide Island and the northern Biscoe Islands (February 1832). 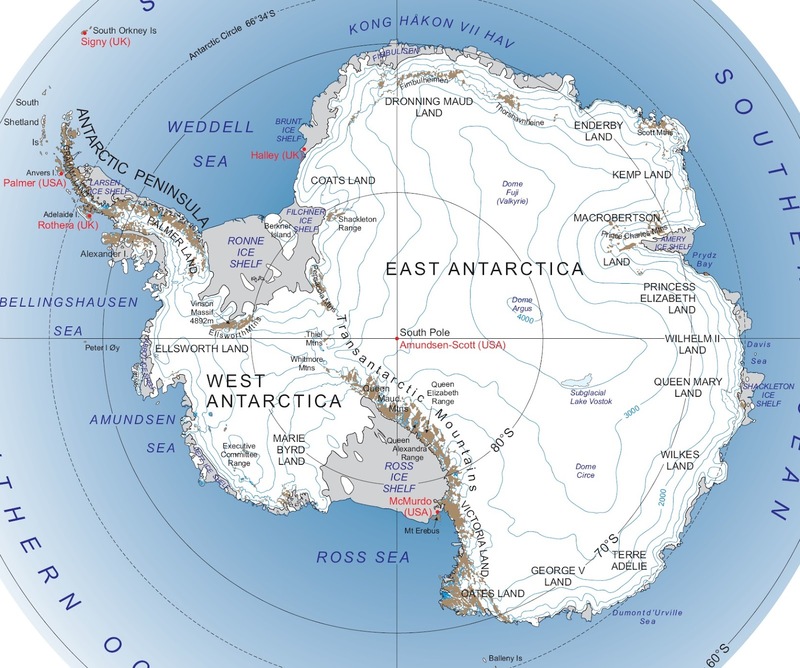 They also discovered and annexed part of the Antarctic peninsula (21 February 1832) in the name of King William IV, calling it Graham Land. After the discovery of Enderby Land the ships were separated during a gale. The Tula put into Hobart Town where she was eventually reunited with the Lively, which made her landfall at Port Phillip. 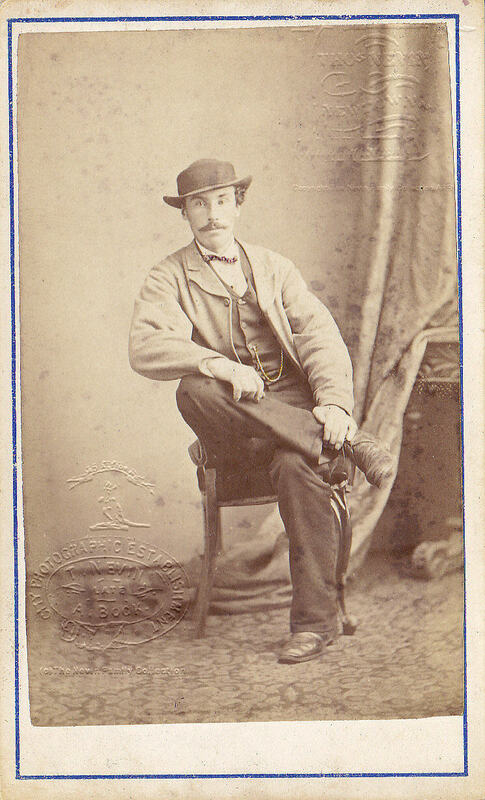 On return to London, Biscoe published the account of his voyage and was awarded the royal premium of the Royal Geographical Society and was similarly honoured by the Paris Société de Géographie. In 1833, despite the lack of commercial success of the previous voyage, Biscoe was nominated by the Enderbys to command a second exploring expedition to the Antarctic in the Hopefull and the Rose, but for reasons unknown the vessels sailed without him and he returned to more humdrum commands trading between Liverpool and the West Indies. 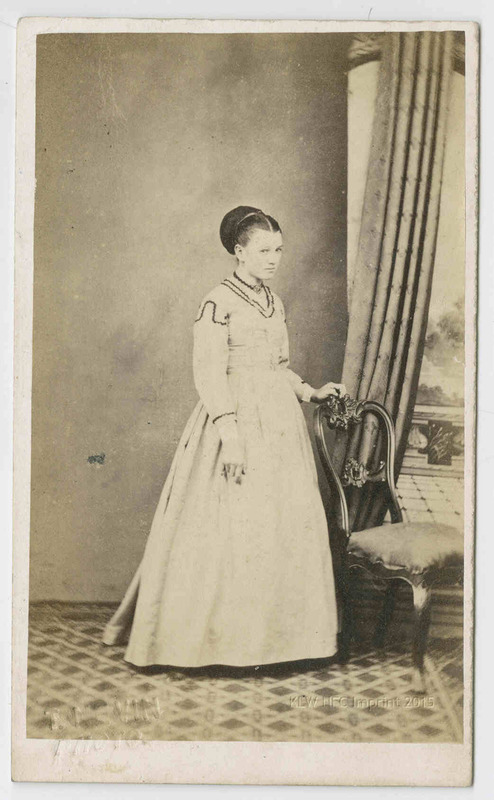 On 8 September 1836 Biscoe married Emma Crowe in London. Next year he sailed for Australia in the Superb. He made an abortive southern sealing and exploring voyage from Port Jackson in 1838-39 in the brig Emma. 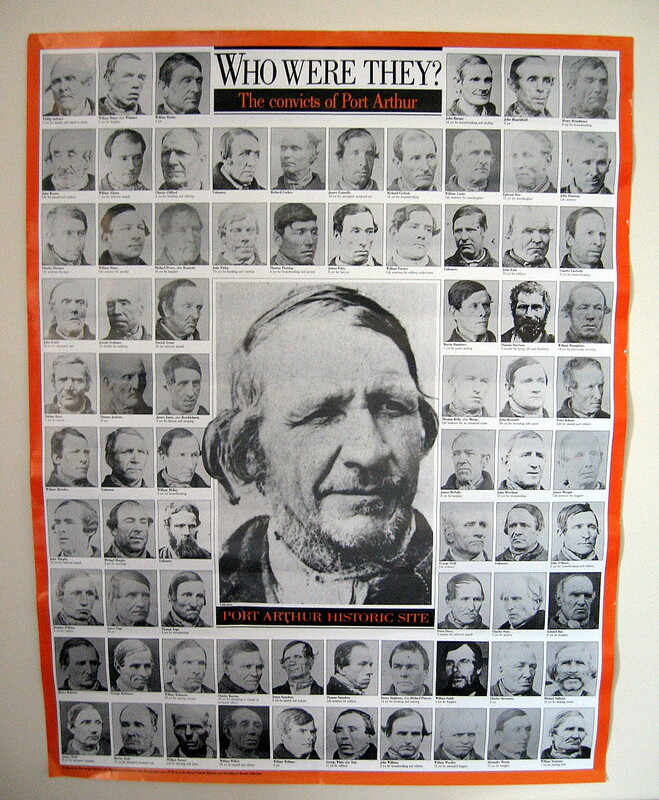 His family moved from Sydney to Hobart in 1840, while Biscoe became master of various intercolonial vessels sailing between Hobart, Sydney and Port Phillip. 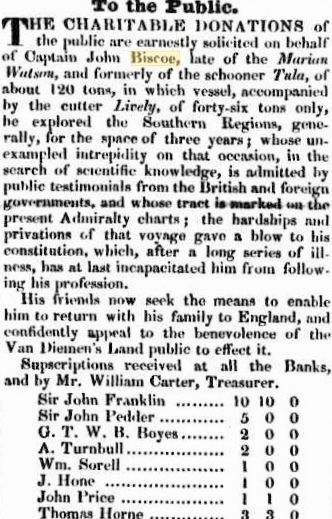 An appeal headed by Sir John Franklin was made in the Hobart newspapers of 1842 for money to send Biscoe back to England. He was described as being incapacitated by much illness due to the privations of his great Antarctic voyage. 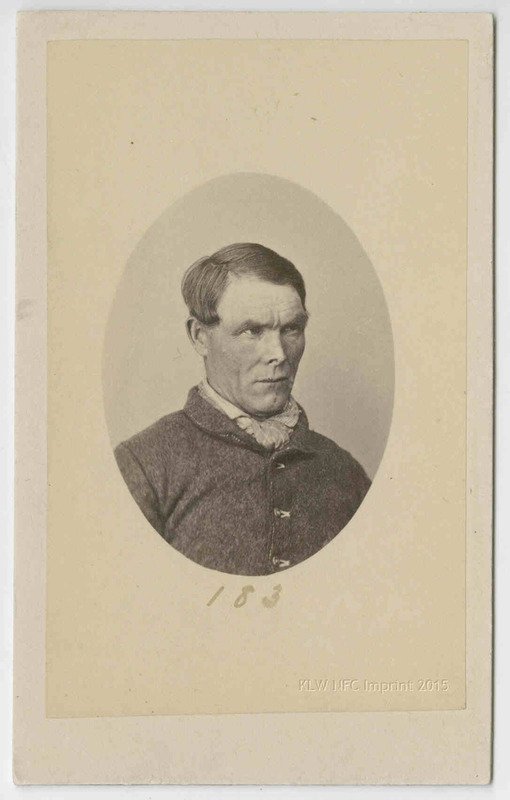 He and his family sailed for London in the barque Janet Izat in February 1843, but Biscoe died at sea. In 1849 an appeal was made in the Nautical Magazine for his widow and four children. 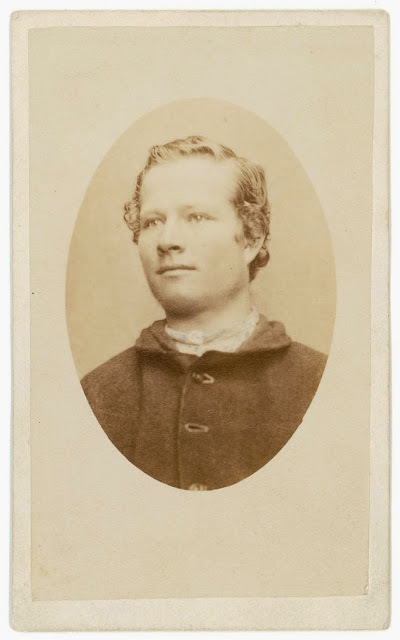 Biscoe followed James Cook and Fabian Bellingshausen in circumnavigating the Antarctic continent. Although organized on much smaller lines than these two national expeditions, his voyage had important geographical results. He was the first to chart portions of the Antarctic continent other than the peninsula. His courage in the face of great difficulties and dangers was admirable, and his perseverance, despite damaged ships, treacherous ice and a diminished crew, went far beyond duty. Sir John Franklin departed Van Diemen’s Land for Port Phillip, Victoria, on board the Flying Fish, in the same year, 22nd November 1843,. 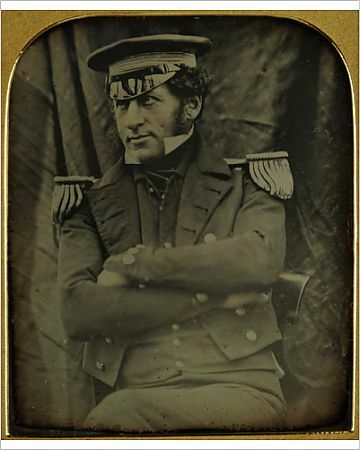 He embarked on the British Naval Northwest Passage Expedition in 1845 only to lose his life in the Canadian Arctic in 1847, along with his entire crew, Members of the expedition were photographed by Richard Beard before departure. Lt. Graham Gore was among those who perished. Three-quarter length portrait of Lieutenant Graham Gore, Commander, seated with arms folded. In recognition of the achievements of John Biscoe, Crown agents bought a wooden, diesel-electric-powered ex-boom defence vessel, 194 feet long with a displacement of 1000 tons on behalf of the Falkland Islands Dependencies Survey to deliver supplies to the Antarctic bases for a year, and named it the John Biscoe. At YouTube: The John Biscoe 1964 NB: this is silent footage. Documentation on file regarding supplying the British Antarctic Survey and refers to the Captain of ‘John Biscoe‘ as William Johnston. LS. Supply ship stuck in ice. LS. Iceberg and pan to men walking on ice and then the ship again. MS. Man climbing up side of ship ‘John Biscoe’ on rope ladder. Angle MS. Looking down on men working in ship’s hold. LS. Man working winch on deck. High angle shot of supplies being raised out of hold. MS. Winch turning. VS. Supplies being loaded into smaller boat. LS. Smaller boat floating away with supplies on. CU. Pilot of supply boat. VS. Small supply boat come alongside ice pack and it’s unloaded. VS. Snowmobile (Powered sledge) being pulled ashore. VS. Snowmobile in action on the snow and ice. VS. Of the snowmobile pilot and view out of window. MS. Snow mobile pulling supply sledge along. LS. The ‘John Biscoe’. LS. Otter Helicopter on the snow to take away supplies. LS. R.N. Otter helicopter in flight taking the supplies away. VS. Helicopter landing on ice and supplies unloaded. VS. Small plane arriving and giving supplies to a small expedition camp and it takes off again. GV. Antarctic landscape pan.